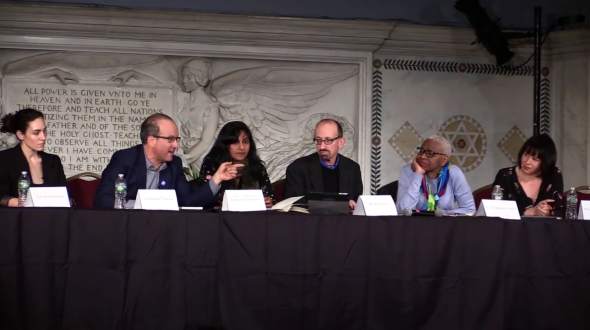 What we talk about when we talk about Bernie bros.
From left: Sarah Leonard, Jonathan Tasini, Kshama Sawant, Brian Lehrer, C. Virginia Fields, and the author at Judson Memorial Church in New York City on Saturday. I’ve tried, at least in public, to avoid the term Bernie bro. I understand why the many women and people of color who are supporting Bernie Sanders for president feel erased by it. I can see why lefty white men feel maligned by the implicit suggestion that they are rejecting Hillary Clinton out of sexism rather than idealism. Nevertheless, the term gets at a particular flavor of sneering condescension that some of his acolytes show toward many women—and, I have to assume, many people of color—who are skeptical about Sanders. If you want to see what I am talking about, I invite you to watch this clarifying moment from a proxy debate between Clinton supporters and Sanders supporters that I took part in on Saturday. The event took place at Judson Memorial, a storied radical church on Washington Square, and was hosted by the New York talk radio host Brian Lehrer. About 80 minutes in, C. Virginia Fields, former Manhattan borough president and current president of the National Black Leadership Commission on AIDS, criticized Sanders for his now infamous New York Daily News interview from earlier this month, in which he seemed to have only vague answers about how he proposed to break up large banks. “As a former elected official, if something is the heart and center of your campaign … you at least are expected to have some sense to be able to put forward a plan in leading that discussion,” Fields said. But when Fields had the temerity to disagree, Tasini wagged his finger at her like she was a dim child and said, “Virginia, you clearly did not read that interview. And, with respect, I don’t think you know anything about the Fed, and you [don’t] know anything about banking.” He added that she wasn’t “comprehending” what Sanders really said. It is hard for me to imagine Tasini speaking that way to a white man. Some might disagree, and there’s probably no way to quantify precise varieties of belittlement. All I can say is that I think many women will recognize it.